I’m not sure why I bother, but I sometimes try to match blog topics with current events. In that tradition I intended to write a few words about civil rights to mark the 50th anniversary of a famous march across the Edmund Pettus Bridge at Selma. I’m glad I waited until after rummaging through my dad’s photograph album, because one picture it contained did shed some local light on the subject. The photo is the one my father took of his sister Alice Switzer and Doris Shaver posing in in their spring finery in front of Dockum Drug in Wichita in 1936. Today there is a 20-foot-long bronze monument on the sidewalk in front of the spot where the Dockum Drug building once stood (the icon in the sidebar links to a Waymark gallery). 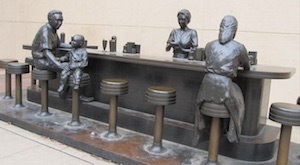 The sculpture shows two adults and a child seated in front of a soda fountain while a waitress behind the counter scribbles something on her pad. It’s meant to remind visitors of a sit-in during the summer of 1958, a protest which caused the manager to change store policy. Until then, black patrons were not allowed to sit at the Dockum lunch counter, but could only stand at the side to place an order and then wait for a carry-out bag. Scarcely reported at the time, it was one of the earliest sit-ins to end racial segregation. It was only a year or two later that changing times caught up with my home town. The old Formoso Mutual Telephone Company was being dissolved. It had been around since 1905, serving Lovewell, Formoso, and Montrose. My aunt Ruth would soon be out of a job because a dial phone switching station was being installed and no one would ever again inquire “Number, please,” and “Are you through?” when a customer wanted his phone to be patched in or unplugged from someone else’s line. No one would be needed to press the shiny black spring-loaded toggle switch at the telephone office that sounded a bell on the connected phone. It would all happen automatically from then on. A crew of young men arrived one summer to do the installation. They were from a Southern state - Georgia, I think - and were a polite, friendly and hard-working bunch. One of the lads dated a local girl, wrote her a letter after they all went home, and then came back to Kansas some months later to marry her. While most were general laborers one of them was an electronics specialist, the Barney Collier of the operation as I remember him, although “Mission Impossible” would not take its first bow on CBS for another three years. Like Greg Morris who played Barney, the man I’ll call “Bob” was African American. Bob quietly did his job, seldom looked up from his work, never spoke unless spoken to, but once addressed, could keep up a gentle stream of small talk. I think I remember seeing him smile once or twice while he chatted with passersby on Main Street, and always picture him wearing wire rim glasses, but then wonder if I’m thinking of Andre Braugher in “Glory.” I’ve watched too much television and seen too many movies to winnow them all out. The Civil Rights Movement was constantly in the national news in those days, and Bob kept the issue from being a complete abstraction in eastern Jewell County. It was no longer a question of “What do all these angry people on television want?" Perhaps a few people even wondered, “What does Bob make of all of this,” but if anyone ever asked him, I never heard about it. I was present when a couple of ladies discussed civil rights in the lobby of the post office one morning. There must have been something that riled one of them on the Huntley-Brinkley report the night before, probably the blurry images of black protestors held at bay by snarling dogs and fire hoses. “If you support equal rights for them, you have to be willing to let one of your kids to marry one,” the other patron countered. “That would be up to … well, I don’t know if I could …” the first speaker began to hedge. “No, you have to be willing to do that, or even marry one yourself, or else you’re a hypocrite,” the woman snapped, as she opened the outer door. “There's your equal rights,” she said, huffing off and shutting the door firmly behind her. I did not know who Lenny Bruce was back then, but I heard a recording of one of his routines while I was at KU which led me back to that conversation in the post office. Bruce mused that white people were less uptight about interracial romance than they were widely assumed to be. He doubted, for instance, that even a Klan leader would prefer snuggling up to Kate Smith on hot summer nights instead of Lena Horne. He also told his audience that after searching her soul, any of their white sisters would jump over fifty Charles Laughtons to get to one Harry Belafonte. Lenny Bruce was probably on the right track, except for there being no need to involve Mr. Belafonte in the equation. Bob would do just fine.